The Wolfpack Wellness Navigation Map features six locations around campus with Talley Student Union being the home for Wolfpack Wellness. The progress bar (right) shows personal progress toward reaching recommended wellness goals. Arriving on NC State University’s campus as a first-year student can be overwhelming. A new home, new experiences and new rigorous classes make for quite the adjustment for first-year students. NC State is committed to the overall well-being of all students and has a range of resources to help first-year students with the transition to college. NC State Dining’s Director of Nutrition and Wellness Lisa Eberhart came to DELTA with a vision for a gamified, interactive module to help students get to know the different wellness resources available on campus and satisfy an objective as part of the Partnership for a Healthier America’s Healthy Campus Initiative. NC State is the only university to meet all 23 objectives of the initiative. After a year of instructional consultations, the Wolfpack Wellness project kicked off in August 2016. The principal investigators included Eberhart and former University Recreation employees Stacy Connell and Suzanne Hunt. Hunt was instrumental in coordinating with campus partners and collecting the necessary information to develop content for the module. University Wellness Specialist Shannon DuPree was added to the team in 2016, and in the fall of 2017, Coordinator of Wellness Programs Alexis Steptoe joined the team replacing Hunt. Partnering with the principal investigators on the project were DELTA’s Lead Instructional Designer and project lead Cathi Dunnagan, Lead Interaction Designer/Developer and media lead Ben Huckaby, PHP Web Developer and Moodle gamification developer Steve Bader, and Lead Project Coordinator Laurie Gyalog. As the scope of the project began to grow with collaborations between DELTA, University Recreation, NC State Dining, Student Health Services, Counseling Center and Alcohol and Other Drug Prevention Education more staff members joined the team. Multimedia Specialist Rich Gurnsey and Instructional Designer Caitlin McKeown were added in May and August 2017. Achievements earned for completing an area of wellness. Housed in Moodle, the Wolfpack Wellness project aims to not only introduce students to wellness resources but also to the primary learning management system used at NC State. “Students get to experience Moodle early on with no pressure,” said Dunnagan. Students gain hands-on experience with Moodle but have the freedom to choose how and when they want to complete the module. The Wolfpack Wellness module includes six elements of wellness: career, financial, physical, social, emotional and community. Students begin their journey at Talley Student Union for an introduction to the module and an overview of wellness. 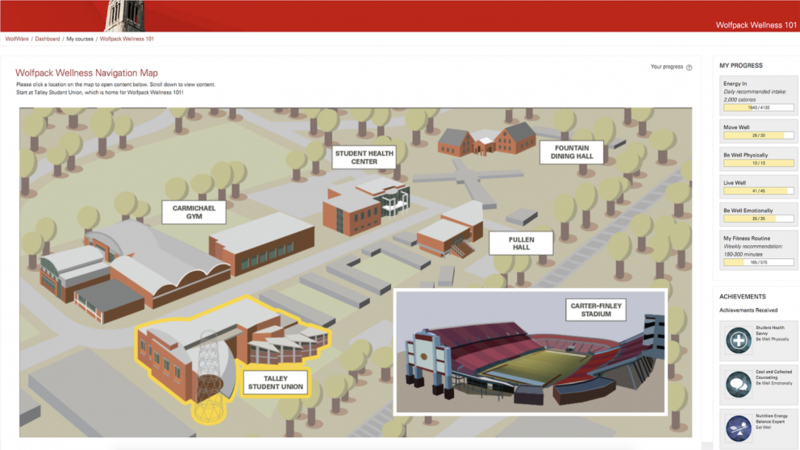 From there, students can choose another location from the navigation map to visit next — Carmichael Gym, Student Health Center, Fountain Dining Hall, Pullen Hall or Carter-Finley Stadium. The map is designed to represent actual buildings on campus in the correct physical locations in relation to each other. Each building was selected to align with the element of wellness that has resources located in that building. This area of campus is the center of activity for first-year students. For Huckaby, this aspect of the map was an integral part of the project because students are learning about beneficial resources and also where to find them on campus. Designed like a game, students earn badges along the way as they complete each area of wellness. They can also see personal progress toward reaching recommended goals via progress bars, a new feature created specifically for Wolfpack Wellness that focuses on the individual, unlike leaderboards that are used to encourage competition among individuals. “The Wolfpack Wellness project strikes a really nice balance where it’s still recognizable and achieves the mission of introducing students to Moodle and the typical format for a Moodle course, but it is lively and interesting with the use of graphics, imagery and different interactive activities so it doesn’t feel like a Moodle course,” Huckaby added. Each location on the map opens a different wellness topic where students explore information about the topic and then respond to a series of questions that relate to real choices and decisions they will have to make in life. “These choice questions help students think through scenarios ahead of time, and will hopefully make them more self-aware and successful,” said Dunnagan. The Order Up! 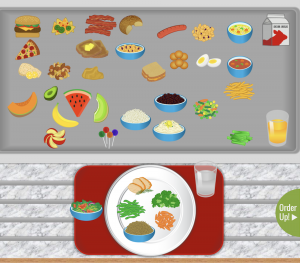 activity encourages students to create a healthy daily diet. Fountain Dining Hall focuses on nutrition featuring questions about eating throughout a student’s day. Also, an interactive drag-and-drop activity encourages eating the recommended 3–5 servings of fruit and vegetables each day. Carmichael Gym features questions about choosing fitness activities throughout the week as well as gives resources about University Recreation. The physical activity bulletin board is an interactive graphic that encourages students to create a weekly fitness routine by exploring activities available on campus. The Student Health Center focuses on the student’s physical and emotional health during the semester with resources about setting up appointments when sick as well as counseling services and how to cope with tough situations. Dunnagan noted that these situations were all based on real cases the counseling center had helped with. At Pullen Hall, students learn about career and financial well-being with choice questions about spring break trips and joining on-campus organizations. This section provides students with resources about the Career Development Center, financial aid and managing a budget. 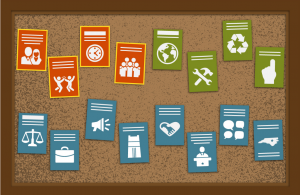 The social engagement bulletin board gives examples of ways to become involved on campus and in the community. Carter-Finley Stadium provides a guide to social and community well-being with resources about becoming involved on campus and Alcohol and Other Drug Prevention Education resources. The choice questions include how to react to situations during tailgating at a football game. “It’s in a non-judgemental way — it’s all about being helpful to the students,” said Huckaby. In addition, this section includes a social engagement bulletin board to encourage student involvement, community service and how to learn and grow as a person. “Decision-tree learning lets students choose any answer, and based on that answer they receive specific feedback. It doesn’t matter which selection they make, the feedback informs them for real-life situations and provides an opportunity to consider what different choices they might make,” said Dunnagan. The project is currently in a testing phase with plans of being implemented in Fall 2018. According to Steptoe, the collaborative vision for the module will be similar to the current AlcoholEdu, where incoming first-year and transfer students will be encouraged to complete the module prior to starting classes at NC State. “This will allow incoming students to have a solid base of wellness resources right at the beginning of their higher education journey. Our hope is that students will be better equipped to access, share and utilize services as they progress through their education at State,” Steptoe added. Dunnagan and Huckaby agree the module will help students feel more comfortable with the campus environment and enable student success.